Hibs have been warned to brace themselves for an under-the-radar title surge from the ever-improving Falkirk. 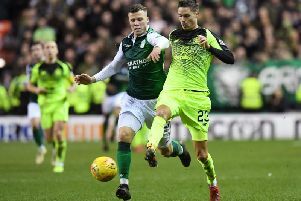 The Easter Road side’s main challenge at the top of the Championship this season has come from Dundee United, whom they visit this Friday night in a much-hyped televised showdown. However, sandwiched in between the two big guns of the division are second-placed Falkirk, who have emerged as the in-form team in the second tier over the past couple of months. Peter Houston’s team had an inconsistent start to the season but are now just six points behind Hibs – albeit having played a game more – after an impressive run in which they have taken 14 points from their last six matches. John Rankin, a former Hibs and United player who was with Falkirk for the first half of the current campaign, believes the Bairns will now fancy their chances of going for first place and should be taken seriously by their more illustrious rivals. Falkirk lost to Kilmarnock in last season’s play-off final after pipping Hibs to second place in the league and then beating them in the play-off semi-final. Rankin believes last season’s experience will serve them well as they aim to maintain their challenge for the next two months.